See in Glossary large bumps and protrusions. 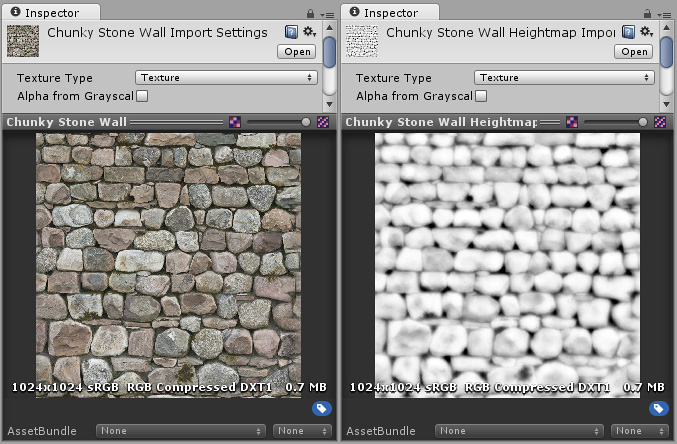 While normal mapping modifies the lighting across the surface of the texture, parallax height mapping goes a step further and actually shifts the areas of the visible surface texture around, to achieve a kind of surface-level occlusion effect. This means that apparent bumps will have their near side (facing the camera) expanded and exaggerated, and their far side (facing away from the camera) will be reduced and seem to be occluded from view. See in Glossary. This means that while surface bumps will appear to protrude and occlude each other, the “silhouette” of the model will never be modified, because ultimately the effect is drawn onto the surface of the model and does not modify the actual geometry. A heightmap should be a greyscale image, with white areas representing the high areas of your texture and black representing the low areas. Here’s a typical albedo map and a heightmap to match. An albedo colour map, and a heightmap to match. Often (but not always) the greyscale image used for a heightmap is also a good image to use for the occlusion map. For information on occlusion maps, see the next section.